If you’re an online marketer or business owner, you need to read this. On the Internet where copy and paste is expected behavior, how do you protect trademarks, copyrights and patents online? You may be thinking trademarks, patents and copyrights are slightly more interesting than taxes or corporate law. However, they’re necessary to protect your business. I recently attended an event organized by the Charlotte American Marketing Association (CAMA) where two legal experts, Natalie Blakeney and Michele Glessner from Alston & Bird LLP, shared their expertise on the topic. Taking turns discussing their particular areas of expertise, they injected humor and real-world experience which caught my attention. 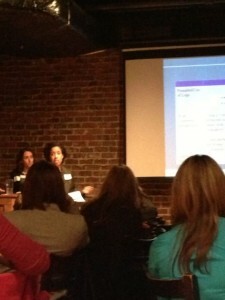 Natalie has experience with copyrights and Michele has experience with patents; both are experienced in trademark law. In their presentation, they both spoke to the difference between the ideal legal scenario and the real-world of marketing. They also shared their experience with other issues like domains that infringe upon trademarks, using language to protect trademarks in marketing materials and concerns related to the internet. As an Internet marketer and business owner, I found the topics helpful. Not wanting to pass up an opportunity to share these important topics with our readers, I asked them if they would be able to join me for an interview and they agreed. Diona: Thanks for joining me. I enjoyed listening to your presentation at CAMA. Your humor and real-world experiences added a lot to the presentation. I'd like to start by asking you to help our readers understand how trademarks, patents and copyrights differ. Michele: You can think about patents as the vehicle by which you can get a monopoly over a particular device, system, or method (which can include software, or what’s known as a computer program product) for a limited amount of time in exchange for telling the public how they can “do” the same thing once your monopoly is over. It’s a quid pro quo, and it applies to inventions that are functional (utility patents) as well as ornamental or aesthetic (design patents). Natalie: Building on Michele’s monopoly theme, trademark rights give the holder the exclusive right to use a distinctive word, phrase, symbol, design, sound, color, smell, or product shape to indicate the source of a good or service and thereby distinguish the trademark owner’s goods and services from competitive third-party goods and services. Trademark rights last as long as the owner uses your trademark to sell goods or services. The copyright system gives the creator of an original creative works (writings, drawings, books, music, sculptures, source code, website interfaces, and the like) exclusive rights to copy, distribute, publicly display, publish, and change the work. The rights begin as soon as the creative work is captured in some sort of fixed medium (for example, a drawing on paper or an audiovisual recording) and last for a limited amount of time. When you think of trademarks, think “source identifier”, and when you think of copyrights, think of creative works. Diona: Natalie mentioned issues with language and demonstrating protection in regards to trademarks and patents; someone in the audience mentioned watermarks for copyrighted images. Tell me more about protecting our intellectual property online. What do we need to consider in regards to protecting these investments online and in marketing materials? Michele: For all forms of intellectual property, notice to third parties of what subject matter is protect is very important. With respect to patents, we’ve all seen the “Patent Pending” or Patent No. markings on products that let you know a particular product is covered by a patent or patent application. The internet can help you save money on product marking by allowing you to list all your products and the patents/applications that cover them on a single website that is available, free of charge, to the public. No more re-tooling when a patent application issues as a patent or when a patent expires. Prior to even filing an application, however, it is important to remember that anything you say about your invention on-line could constitute a public disclosure, which starts the clock ticking for filing your patent application with the Patent Office. Natalie: Likewise with trademarks and copyrights – it is important, although not essential, to give notice of your rights. Certain designations let people know that you’re claiming proprietary rights and that they should think twice before copying or attempting to imitate your trademark or copyright. If possible, place a TM superscript on the upper right hand corner (like KNOWMADTM) of your trademark. If your trademark is registered with the U.S. Patent & Trademark Office (USPTO), use an encircled R (for example, KNOWMAD®). For creative works entitled to copyright protections, there are three components of a copyright notice – (1) the encircled ©, the word Copyright or the abbreviation Copr. (2) the year that the work with published for the public, and (3) the name of the owner. Put that all together and you get something like © 2012 Knowmad – which I hope you have posted at the bottom of your blog Diona! One of the seminar attendees mentioned that her company embeds watermarks in photographs posted online so that, if the photographs are reported or republished without permission, it’s still clear who owns the photograph. This creative strategy gives them a way to track where their photographs end up, and, if they wanted to, put a stop to the unauthorized use. Diona: Natalie just added something new to my to-do list! It sounds like I need to update our logo to the encircled R now that it's been registered. Speaking of our trademark, if someone pluralizes our trademark name plural or changes the spelling, is that infringement? Michele: I’ll let Natalie take this one. Natalie: Such imprecise use of any trademark is trademark abuse. Another example of abuse is using a trademark as a noun instead of an adjective. For example, a COACH® purse should be referred to as a COACH® purse (where COACH® is an adjective describe to the product, purses, and it would be improper to ref to the purse simply as a COACH®. On its own, trademark abuse does equate to trademark infringement. However, if such abuse is widespread and consistent, it can lead to “genericide” of the trademark, which detracts from the distinctiveness of the mark and destroys the trademark owner’s exclusivity and ability to stop others from using the mark. Thermos, aspirin, escalator, and pilates were once distinctive trademarks exclusively owned by particular entities. But folks abusively used these “trademarks” as nouns leading to genericide. Now, we all use these terms as generic words and I imagine they are all listed in the dictionary. We no longer associated these terms with a specific source of goods – we no longer consider them to be distinctive trademarks. That was a long answer, but I hope it makes sense. Trademarks rights and the preservation thereof is so very important but it can get complicated! Diona: I heard you say that to file or protect a trademark, a company needs to demonstrate use in commerce. Does the law account for online use for a blog or e-commerce store? Michele: You can file a trademark application as an intent-to-use application, i.e., prior to using the mark in commerce. However, the Trademark Office will not register your mark until you submit evidence that you have begun using the mark to sell your goods and services. I’ll let Natalie speak as to what may be considered use in commerce. Natalie: For a product, the USPTO simply wants to see that you are using the trademark on the product or on a website or in a catalog from which the product can be ordered. For services, you have to show that you are using the alleged trademark in advertisements for the services. If the trademark is actually used and used properly, demonstrating use is simple. Use of a trademark as a blog title would easily constitute use of a trademark use with blogging or information services. Diona: When we file a trademark, would you recommend buying the domain variations for the name? Michele: Yes, within reason. If your budget allows, common or frequent misspellings of your domain name are good candidates, as are common variations that your customers may use to refer to your company. Diona: In regards to online content, what should we copyright? Are there any automatic considerations for copyright? For example, let’s say someone copies my blog post and puts it on their website as their own material, do I have any protection? Michele: It’s important to remember that copyright protection occurs, under common law (automatically), the moment you have an original work of authorship that “fixed in a tangible medium of expression.” Federal registration comes into play with respect to suing others for infringing your copyright and collecting damages. You should be protected against someone copying your blog post, assuming your post is an original work of authorship. Natalie: The same comments apply to pictures posted on social media. A recent judicial decision advises that you cannot repost, reTweet or otherwise republish proprietary content, such as original photographs that appear on Twitter, without permission of the copyright owner. Diona: What can I do to protect myself on my own and when do I need legal counsel? Michele: Patents are typically complicated beasts, and the language that is used to define your claims (your legal boundaries for the scope of the invention) is not your typical English, so you would benefit greatly from the advice of an experienced attorney. You also don’t want to get hit with a lawsuit by a third party who owns a patent for a product you’re about to launch, so remember that patent attorneys can search the relevant fields and advise you as to whether you may be at risk and, sometimes, direct you as to how you can re-design your product to avoid potential claims of infringement by third parties. Natalie: Intellectual property enforcement can get complicated rather quickly. When you’re dealing with someone ripping off your ideas or your creative work, whether it be a trademark or copyrightable creative work, it’s easy to get emotional and sometimes difficult to decipher the line where your rights begin. By taking matters into your own hands, you run the risk of saying of doing something that hurts your rights later. Most IP attorneys provide free consultations as part of their business development efforts. So, when in doubt, just ask for a quick, high level opinion. It’s important to be proactive and seek copyright and trademark registration to bolster your rights before infringement happens – it’s like insurance and the added security of insurance. Although registration is not required, registration has significant benefits, especially if you run into the problem of infringement. Diona: You mentioned an ICANN policy regarding domain names that infringe on a trademark. Can you tell us more about that? Michele: Natalie, go for it. Natalie: Yes, let’s say you find that someone is using your trademark as part of a domain name that is not connected to a valid website or, even worse, you find that such a domain name is being used to hurt you (for example, use with a competitor’s website or to distract consumers looking for your website). Well, you can file an ICANN complaint to basically say hey, that’s my trademark, they aren’t using it fairly, and the way they are using is hurting or likely to hurt my business. If you can prove a few factors, you’ll win the proceeding and the domain name will be transferred to you. It’s a bit more complicated that, but I hope I’ve painted a clear picture! You can find out more by reading about the Domain-name Dispute-Resolution policy on the ICANN website. Diona: Any final thoughts or advice? Michele: When in doubt, get some help. You can start with the USPTO website at www.uspto.gov, which has some great FAQs for solo inventors and everyday people. In the event you can’t find what you need there or you have a “gut feeling” that you might be stepping into something that’s over your head, it’s probably a good idea to reach out to an attorney for some advice. Natalie: Agreed! Most IP attorneys provide no-cost consultations. Better to be proactive and safe than frustrated and sorry later. The idea of lawyers and legal fees can be daunting, but we really are here to help, and you may get enough from a consultation to handle the situation yourself. To find out more about protecting your intellectual property online or speak to Natalie Blakeney or Michele Glessner, visit the Alston & Bird website (www.alston.com).